After more than a year of speculation and travels to political hotspots across the country, Los Angeles Mayor Eric Garcetti announced Tuesday he has decided against a bid for the presidency in 2020. Garcetti was re-elected to a second term in 2017 in a landslide and has openly explored a potential presidential run ever since through a number of political trips, including visits to Iowa, New Hampshire and South Carolina. 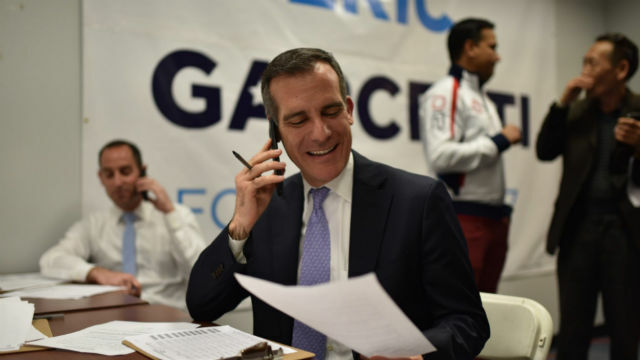 But with a likely Democratic field that political experts estimate will reach more than 20 contenders, Garcetti chose to stay at City Hall for the time being. “This was not an easy decision given the extraordinary times we live in,” he said. “As an American, like so many of us, we look to Washington for our better angels. We look to a government that would be kind and caring, but today we see one that is corrupt and cruel. Worst of all, they can’t seem to get anything done. He said he was encouraged by the people who have already thrown their hats into the ring. Until as recently as last week, Garcetti acknowledged to reporters he was still thinking of running. During the time he has explored a run, Garcetti has not gained much traction outside of some media profiles. A CNN poll in October had him pulling 2 percent of support out of a list of 16 potential candidates, including former Vice President Joe Biden, who led the poll with 33 percent support. Garcetti’s announcement comes on the heels of several other high- profile candidates who announced officially they were running, including California Sen. Kamala Harris, who drew an estimated 20,000 people to a rally in Oakland on Sunday. But Garcetti denied that Harris’ candidacy scared him off from running. “I wouldn’t have run for mayor if it was about being an underdog, or who else is in the race. You’ve really got to listen to your own heart,” he said. City Councilman Gil Cedillo told City News Service he has been encouraging Garcetti to seek the presidency. Garcetti, 47, comes from a politically connected family, as his father, Gil Garcetti, is a former Los Angeles County district attorney perhaps most famous for overseeing the failed prosecution of O.J. Simpson’s double- murder case in the mid-1990s. Garcetti grew up in the San Fernando Valley as the son of a Jewish mother and a father of Mexican and Italian descent. He speaks often of his Mexican roots and is fluent in Spanish, frequently dedicating a portion of his news conferences to speaking Spanish. Garcetti earned bachelor’s and master’s degrees at Columbia University before becoming a Rhodes Scholar at Oxford University. 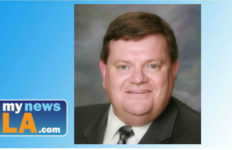 He taught international affairs at both the University of Southern California and Occidental College before winning a seat on the City Council in 2001, representing the 13th District, which includes parts of Hollywood. Four times Garcetti was elected by the 15-member City Council to serve as its president, and he earned a reputation as a calm, level-headed politician who works to find common ground and avoid political infighting. In 2013, Garcetti beat out fellow Democrat Wendy Greuel to become the city’s first mayor of Jewish descent. As mayor, Garcetti has overseen a rising budget due to a strong local and national economy while putting an emphasis on environmental initiatives, programs to help the homeless, and traffic safety. In 2015, he backed a plan to raise the city’s minimum wage to $15 by 2020. Garcetti rarely if ever openly criticizes the City Council, preferring to project himself as a consensus builder, and typically will chose to avoid any direct challenges to other city leaders, either in his speeches or when asked direct questions by reporters. Garcetti and his wife, Amy Wakeland, have one adopted daughter, Maya, and have also been foster parents.